Now you’ve invested time and resources in a sleek TV, it’s time to blend it seamlessly in your living room or boardroom area. This is where we come in the picture. We’ll figure out where all cables fit , and route messy wiring so they’re out of sight. We have solutions that use a paintable channel, fished through the wall or using floor cord protectors that will make clean your mismanaged and messy cabling. Wires in an around Network racks and wall mounted TV’s have a tendency to get messy after some time, and over all the changes. From time to time it becomes necessary to preform a clean up. Messy can cause excessive strain on patch cables because of the lack of cable management, or from the weight of service loops. The pictures below are a typical job we do. 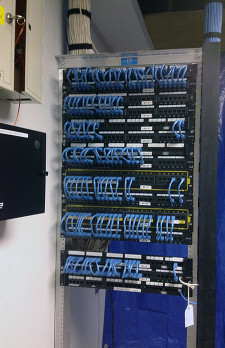 Over the years the network grew and network switches were added or removed. Wires seemed to multiply on their own, and nobody really knew anymore how it got that way. After we carefully identified each cable and mapped out the current network, we installed new patch panels, and installed Wire Management. The results are obvious. 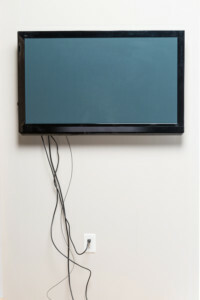 Cables and cords are often in abundance in conferencing rooms due to the many technologies that businesses employ when holding virtual meetings. Make sure that all of your cables, cords, dongles, etc. are in good working order and not broken or tangled. Use only the exact number of cables that you need, and put the rest away in a drawer or closet. 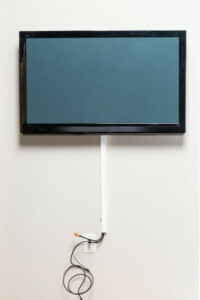 Keep the cables out of sight – no one wants to see that distracting mess when they’re trying to videoconference!